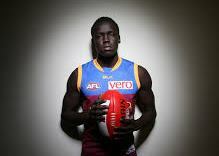 Majak Daw may have kicked open the door for future Sudanese players, and others from a variety of African countries, but this year has seen first Aliir Aliir debut for the Sydney Swans and now this weekend, the AFL’s showcase 2016 Toyota AFL Multicultural Round, Brisbane Lions rookie, Reuben William, will debut. William was one of three Sudanese born players to be rookie listed at last year’s draft along with Gach Nyuon (Essendon) and Mabior Chol (Richmond). But William is the first of the three to be upgraded from the rookie list and be selected for his first senior match. Like most other current African-born players, William has experienced a journey way beyond the realms of the average AFL player to reach this day. His father died in Sudan’s civil war and his mother took the kids and fled to a refugee camp in Sudan. In 2002 the family migrated to Australia, Reuben as a four year old, and from there his exposure to footy saw him excel through junior pathways to drafting by the Lions. Like so many of his fellow Sudanese juniors to make the highest level, it has been an extraordinary journey, and one that William will cherish. According to the www.afl.com.au website, in a story by Michael Whiting, his recent journey has accelerated from last year’s state Under 18 team to playing in the NEAFL this year, replacing Dayne Beams when he was placed on Brisbane’s long-term injury list. According to the website, William was shocked when told the news by Lions’ captain Tom Rockliff. "I'll go out there and put on the jumper with pride." Certainly people who know Reuben William know he will indeed play with pride. The pride of a family who have sacrificed much along the way to now see this day.